If you have ever sat on the couch to watch TV and eat “a few” chips and then stared down into an empty bag, mindful eating might make a difference. The practice, which has gone from new-age to mainstream in the last decade, is now a wellness buzzword. It can mean not only losing weight but improving mental health, too. (STOCK PHOTO/Getty Images) A woman spreads jam on her bread while having tea in this undated stock photo. "It's about eating the foods you love but in a mindful way, your awareness of hunger cues, your awareness of taste," Albers explained. "When you tune into these cues, you enjoy food more and you're more in control of your eating." It can be a "radical shift" when you let go of a diet mentality and embrace mindful eating, Albers noted. "One obstacle [to mindful eating] is letting go that there are “good” foods and “bad” foods, and learning to trust that your body will tell you when it's time to stop eating," she said. While mindful eating may help with weight loss -- it aids with digestion and makes you aware of your food, according to Albers -- it is not the main focus of the practice. 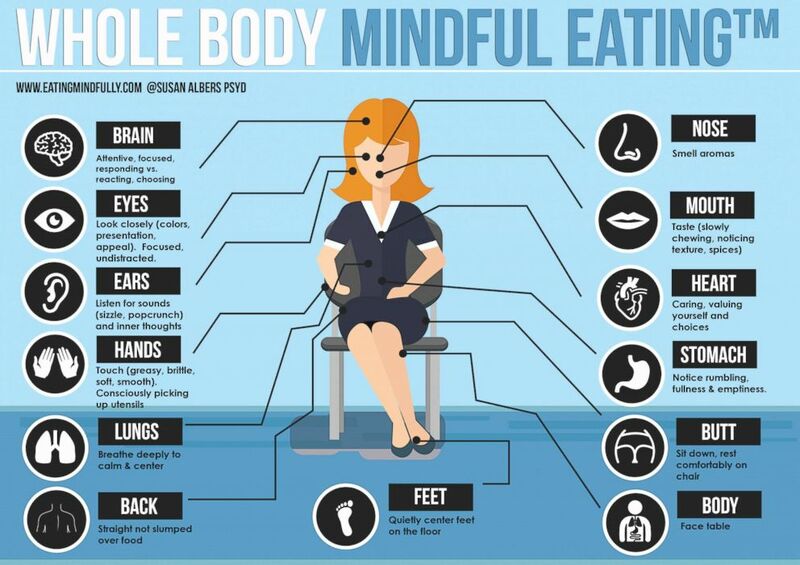 Mindful eating is instead focused on strengthening a healthy, balanced relationship with food. "The intention of mindful eating is to remain in the present moment by promoting acceptance, non-judgment, and curiosity about an individual’s direct experience," according to the Center for Mindful Eating, a non-profit organization that promotes the practice. "It is not outcome-based and does not promote any specific body shape or size." (STOCK PHOTO/Getty Images) In this undated stock photo, a young woman having breakfast at home. You are eating mindfully if you are focusing fully on the food you are eating and are aware and accepting of your thoughts. That can be done anywhere, as long as you eliminate the distractions in your environment when you eat. "It is about focus," said Albers. The biggest misconception about mindful eating, according to Albers, is that it means people have to commit hours to each meal. (STOCK PHOTO/Getty Images) A woman eats in this undated stock photo. “It is things that are 1-second, that shift your focus into the moment to have this different relationship with food and your habits around food,” she said. Albers, for example, swivels her desk chair at lunch so she is eating her meal away from her computer, a 1-second shift toward paying attention to her food. Another 1-second shift can be something as simple as putting chips in a bowl or on a plate instead of eating them from the bag -- you can actually see the chips and the portion, she explained. Albers has created what she calls the "five S's of mindful eating." Give them a try at your next meal. 1. Sit down: Make sure you have the time to sit down and tune into the taste of your food. Even if you are on the go, take time to park your car and eat instead of trying to multi-task, or if you are walking, find a bench to sit and enjoy your meal. 2. Savor: Tune into the textures of the food and ask yourself, "What does it taste like? What is the sound I hear when I take a bite? What does it smell like?" 3. Slowly chew: Taste don't race, according to Albers. 4. Simplify your environment: When you eat, just eat. Put away distractions like your phone and turn the TV off. Look around your environment to make sure it is as relaxing as possible. 5. Smile: Smiling in between bites of food will give you an extra mindful moment.